Orlando, Fla.– My Energy Geek, an energy company specializing in solar, efficiency and otherwise green energy solutions for homeowners, recently announced that it will offer a free home energy evaluation to potential residential customers. Brandon Wood, president of My Energy Geek said the home energy evaluation, valued at an estimated $399, will be performed by one of the company’s highly-trained employees who will analyze a home’s energy consumption and determine where energy is not being provided efficiently – both in the home and in its energy system. The evaluation will then determine what the inefficiencies are costing the homeowner and provide a detailed plan to reduce costs along with any strategies available to lower the customer’s energy bill, according to Wood. “Occasionally the evaluation reveals the possibility of completely eliminating a customer’s power bill over the course of time with green energy-generating systems,” Wood said. The home energy evaluation will be available to a limited number of potential customers who indicate and interest by completing the form at the My Energy Geek website, http://myenergygeek.com. The free evaluation offer includes a focused survey of the greatest contributing factors to the home’s total utility bill – the heating and cooling systems, which include the A/C unit, duct work and insulation. The evaluation also covers an inspection of the hot water tank, windows, doors, outlets and light bulbs. Among the specific energy efficiency solutions offered by My Energy Geek are energy-efficient appliances; attic, window, garage door and reflective insulation; ventilation and air sealing solutions. They also offer green energy products that power your home using solar power. Over time, these solar power generation solutions have proven to gradually reduce an energy bill and even, in some cases, phase out the bill entirely over a period of years. These solar power products are subject to programs like tax incentives and financing that can help a homeowner subsidize the initial cost of the equipment. 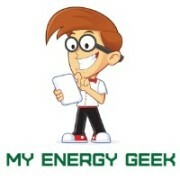 My Energy Geek is a client company of the UCF Business Incubation Program in Orlando. For information on My Energy Geek: Brandon Wood, President, My Energy Geek, (407) 901-5001, info@MyEnergyGeek.com. For information on the UCF Business Incubation Program: Michael Weiss, Site Manager, UCF Business Incubator-Orlando, 321-281-8384, Michael.Weiss@ucf.edu. Larry Vershel or Beth Payan, Larry Vershel Communications Inc., 407-644-4142, Lvershelco@aol.com.